Warehouses are becoming busier and busier places, with rows upon rows of shelving units and increasing demands for better, faster fulfillment. Warehouse technology has been growing over recent years to accommodate increasingly complex work days. Safety technology can help employers create a safer and more efficient workplace both for their workers and their bottom lines. In this article, industry experts dish out on the latest warehouse safety technologies emerging in the logistics and manufacturing sectors to help improve workflow and protect employees. However, as exciting as new technological devices may be, no tool can replace the importance of proper operator training. Learn more below to see which new safety tools are working in harmony with trained workers to help workplaces prevent accidents. 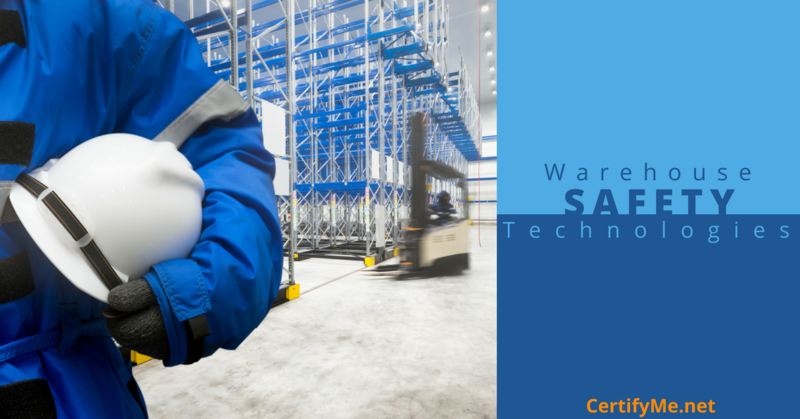 From robots to beer kegs to tracking devices, there is a wide range of warehouse safety technologies coming out that can help many different aspects of warehousing and many industries. NextShift Robotics, a company producing robots that work alongside human warehouse workers, is on the cutting edge of the increasingly popular move to automation. While humans are left to pick items from the shelves, the robots are programmed to lift and carry heavy items over long distances in a warehouse. Since machines don’t have the creative thinking or decision making skills that humans do, they still aren’t good matches for picking orders. Carrying and moving orders, however, they can greatly benefit the workplace. NextShift robots are wired to a software system that instructs them to recognize humans and other obstacles and get out of the way. The robots are easily integrated into any warehouse that wants to increase productivity during worker breaks, avoid repetitive stress injuries, prevent muscle pulls and strains, and prevent accidents caused by worker fatigue. The Keg Flow from UNEX, an order picking solutions company specializing in the manufacturing and distribution industries, is no stranger to the dangers of placing and picking goods at towering heights on shelving racks. All-too common accidents involving shelved items include falling objects onto workers and equipment operators, and damaged goods that have fallen from a shelving unit. When objects are placed too high on shelving and missing safety devices like end caps, workers are put at risk of being hit with heavy objects when order picking or when an object simply is able to slide off the rack. Kegs, in particular, cause a lot of headache in warehouses due to their awkward shape and considerable weight. UNEX has created a solution with the Keg Flow, a storage system for kegs that comes with side rails to keep beer kegs steady, a custom hanger to provide fractional pitch and a high roller stop to prevent kegs from rolling off the rack. Utilizing storage saving racks, the Keg Flow makes order picking easy by releasing a keg into the slot each time a keg is pulled out. Each keg is also labeled which helps workers avoid incorrect order picks. Another warehouse tool from UNEX is the Pick-Plank, a mechanical order picking device that attaches to a pallet and converts each pick slot into a dynamic storage position from a static one. It allows all items on a pallet to be accessible from the aisle. When workers are having to constantly reach and crawl to pick items, sprains, strains and back injuries are commonplace. Made of industrial steel, the Pick-Plank can hold up to 1,200 pounds and handle case picking that’s less than a full pallet from a man aboard order picker. It eliminates the need for workers to have to reach or crawl into a storage area to pick goods. The Pick-Plank works by picking items in the front of the storage area so that workers can unlock the guides and slide the back half of the pallet to the front position. All products are then moved to the front of the aisle, significantly improving the picking process. Many unsafe and inefficient work practices take place when nothing is recorded and action to improve them can’t effectively move forward. Tobii Pro, a leading tech provider, has created a wearable eye tracker called the Tobii Pro Glasses 2 that are designed to capture the natural viewing behavior in a real-world work environment. They can provide significant insight into the practices of employees to catch unsafe or inefficient practices. The Tobii Pro Glasses 2 give employers’ objective perspectives into the natural human behavior of their employees or managers. The glasses provide a live view and record exactly what a person is looking at in real time as they move freely about their normal tasks. While the glasses can be used for research purposes into the minds and actions of consumers, they can also help warehouse employers and managers discover practices that may not be as safe or efficient as they thought, including distractions or areas in their warehouse that are causing disruptions or accidents. The design of the glasses is unobtrusive, made without side or bottom frames, to maintain the wearer’s maximum field of view. Tobii Pro recently announced eye trackers that can fit within a helmet, increasing the range of their uses especially in the warehousing industry. Through a study of the eye trackers conducted at the H&H Castings metal foundry, researchers found that the eye trackers were able to provide a much closer and more detailed perspective of work practices for new hires, improving their training and onboarding process. New technology is always exciting and interesting. It has and continues to be a great form of accident prevention and productivity booster, but it can’t replace the effectiveness of operator training. Where order picking workers and forklifts are used, proper operator training is a must-have for any workplace. Forklifts contribute to many warehouse accidents every year and forklift training is still the number one best way to prevent forklift-related accidents, such as falling objects, tip-overs, and workers being hit by forklifts. Training is also a requirement from OSHA. If you want to increase the safety in your warehouse and boost productivity, it’s always best to start with operator training. If you’re looking for the most convenient, affordable and high-quality forklift training you can find, you’re in luck. At CertifyMe.net, our programs are completely online and allow workers to train at their own pace from any device with an internet connection. In only about one hour on average, workers can be trained and certified to operate forklifts, and be 100% OSHA-compliant. Not only will these workers have the skills and knowledge they need to operate forklifts safely and properly, but they will be able to help you create a safer and more efficient workplace. Check out the online forklift classes from CertifyMe.net today, and learn how you can keep the entire training process in-house with our Trainer program.